“Within our dreams and aspirations we find our opportunities” this saying by Sue Atchley Ebaugh summarizes my life so far. It was during my early teenage years that I dreamt of living in a forest and working on snakes, and these dreams paved the way to doors of opportunities which I embraced. Its been over two decades now and I am happy to say that I am living my passion everyday! I started handling reptiles at the age of thirteen and never looked back since. My stint as an animal inspector (at KARUNA, formerly BSPCA, Bangalore Society for the Prevention of Cruelty to Animals) , education officer (at the Center for Herpetology, Madras Crocodile Bank Trust, Mamalapuram Chennai),a Conservation Officer at the Agumbe Rainforest Research Station (ARRS), molded me well for my current profile as a conservationist. I am based at Agumbe and focus primarily on studying and conserving king cobras. I have been staying at Agumbe for over five years and during this time had life time opportunities of observing and documenting the nesting, male combat, courtship, mating and cannibalistic behaviors of king cobras in the wild. I was also instrumental in the pioneer efforts of ARRS in conducting radio telemetry study on king cobras. I have worked for several wildlife documentaries behind screen, and featured along side Rom in two wildlife documentaries, ‘The King and I’, ‘Secrets of the King Cobra ‘, ‘Asia’s Deadliest Snake’ , ‘One Million Snake Bites’ and ‘Wildest India’ by BBC, National Geographic Channel, Nat Geo Wild and Discovery channel respectively. Apart from rescuing over hundred king cobras from distress situations I have collected vital scientific data which has led to new insights into the life of a king cobra. My interests lie in studying the ecology, breeding biology, and conservation biology of king cobras. I also find it very important and satisfying in reaching out to masses through education programs. Sharmila and I shared a common vision for over a decade. We got married in November 2008 and now work as a team towards realizing this. Formerly, she was techie with Microsoft GTSC working on database management systems. An M.Tech post graduate in computer science her interests are varied from Microsoft SQL server, to blogging, writing, reptiles, bird watching, ants and butterflies. Note: The purpose of this blog is to reach out to people to share my thoughts and experiences. But as most of you know I am a good story teller but not all that great at writing. This is where Sharmila comes in to help me out. We sit together, I narrate my experiences and she puts them into words in her own style. An amalgamation of thoughts and skills! Hope you all enjoy reading our posts! Gowrish, I want to congrats and appreciate your efforts to setup ARRS and First King Corbra study in the world..in Agumbe, Karnataka.. Your efforts are always appreciable.. I have seen both your documentaries like King and I, Secrets of King on NGC, I do remember in recent times the only forest from Karnataka show on NGC is ARRS Agumbe. Infact i recorded your programme telecasted from NGC & discovery channels. Can we also join with your team, so that we can explore the agumbe forest. Another we are also having trekking habit, can you send some guide for trekking in this forest. Thank you very much Dr.Prasanna. I will write to you personally with details you have requested for. Congratulations to you and Sharmila… for this wonderful blog. Your work is really fascinating. I really want to visit ARRS. I am a fan of Romulus Whitaker and want to meet him in person. Is it possible? Hats off to Romulus Whitaker and you to protect this highly endangered and much-feared snake. Thank you Poonam, I am glad you and your daughter like our work. Pictures tumba chennagi ide, looking forward to a trip to Agumbe when I return to India in March. hi gowri shankar, this is Nilutpal, remember a boy from assam, we met in ZSI with my excursion team, Alipore, I asked u a lot about snakes. i love snakes and reptiles, I am glad to meet you, and surely one day again i’ll meet you in some forest. thanks a lot for those inspiration. I am a photographer and would like to shoot all the little creatures of the world! I primarily shoot butterfly and I love them! I haven’t got a chance to take the snaps of snakes in the wild. I hope if i get a chance I can do that as well. As with Harish’s question can common ppl get into agumbe forest for a photo shoot of the little wonders of nature?? Thanks Arun. We conduct nature, herp and photography camps quite often at ARRS. This is a good opportunity for you to shoot both big and small wonders. You could be part of this or if you’d like to explore yourself you can visit ARRS (arrs.india@gmail.com) as a visitor. Hope this helps. This is guru, think you remember, really a great experience for me, i want to know more about snakes. As you said i will start my homework. Please guide me if i have any doubts. It was a pleasure meeting you too Guru. Will surely guide you any time. A very nice blog with loads of information & awesome pictures, I always had a dream to see the KING in wild & during my stay at ARRS ..you not only made me to see it but also to shake hands with King (You). A very hearty good wishes for your work & godbless you all 🙂 . I am Sindhu from Bangalore. I found out about ARRS, Romulus and your work through “King cobra & I”. I must say, it is one of the most wonderful documentaries ever made. The spectacular beauty of western ghats, the Malnad is beyond words. The glamorous black king, his poise and dignity are somethings beyond mere words of appreciation. Thanks to your work, it truly feels proud to be a part of this wonderful state. My love for wildlife dates back to childhood when I wrote articles for my school and college magazines on tiger conservation, poaching reptiles for skin, poaching in Africa and other topics. I grew up watching Animal planet, discovery and NAT GEO and I still do. Every show I watch seems all those Children’s book on wildlife/encyclopedia coming true. To me there is nothing more fascinating than wildlife and nature. My love has further pushed me to pursue a hobby in wildlife photography. Glad to see your interest Sindhu. Please check my response over email. Thank you Vikram. You are most welcome to join me. Greetings from the Chennai Trekking Club a 14000 member non profit volunteered based group of nature enthusiasts. As part of our 4th birthday we are organising an awareness event on nature and wildlife on march 10-11. Would you be interested to give a talk as a guest speaker? I have heard about your club and congratulations on your 4th birthday. But sorry I will not be able to deliver a talk as I am away at North Orissa during that time. All the best. My son has chosen to do his year 4 science project on the King Cobra so I’ve been trying to find info online for him. Your website has some brilliant information & beautiful photos .. great work! The short presentation you have posted would be really useful to show him but it keeps crashing on my pc .. do you have a powerpoint version you could email or a .pdf? Good to know that Helen. I have emailed the pdf version of the presentation to you. All the best to your son. I want your real email id for private communication. Recently a Cobra was killed because the rescer took lot of time to reach as he was far away and the locals didn’t want to loose the snake. In another incident a group of people killed a Cobra just because if they call rescuer they will have to pay him money (a mear Rs.500). This disregard to a snake’s/animal’s life left me shattered and made me think if I could take up some training for rescuing animals including snakes and also study more on rescue and post rescue insights. I want to volunteer in ARRS for a month, the phone is dead i guess out there. Please write to them at arrs.india@gmail.com. Cool post . Thanks for, visiting my blog dude. I shall email you soon. I did not realise that! Thank you. Sorry, I will be off to Amboli herp workshop during these dates. Please contact info@rainforestecology.com for this. Thanks. I have emailed them. Hi Mr.Gowri Shankar, this blog provides a very interesting insight into the snakes world. I just want to clarify something. I heard a rumour that once a snake is 100 years old (which is unbelievable to me), it produces a stone called “Naga Manickam” and uses it to find prey. Is this true? I also heard another about a snake sprouting wings once it is 100 years old. It sounded a bit absurd but I wanted conformation from a professional viewpoint. Are these rumours true or is it all like those superstitions that swivel around snakes? These are all just myths. There is no truth to it. It was a pleasure to meet you along with Joy . Happy to note that , in spite of being a world famous herpetologist, you still show great humility. You two are a rare couple, completely devoted in the conservation of nature and protecting the biodiversity of the fragile western ghats. Day in and day out you are exposed to life threatening risks and yet you go all out to save these beautiful awe inspiring reptiles. We salute you and wish you great success in all your endeavours. It was our pleasure to meet you and thank you for your comment. We are humbled by your praise and thank you for your wishes. There is of course lots to do. We really hope to meet you and your wife sometime and learn about your innovative inventions about which though we wanted to discuss could not happen due to time constraints. Please do visit us at Agumbe, it will be our pleasure to have you here. I have seen your documentaries . They are just great . Hope you enjoy your work even more . I had actually visited arrs when I was in 7th std . I dont think you remember but its ok . I am in 2nd pu now and I am planning to visit arrs once again . Thank you. Well I am not associated with ARRS anymore. I have an environment education centre are Agumbe called the Kalinga Centre for Rainforest Ecology. All the best to you. I came to know that king kobras change thier skin color slightly during change in seasons . Is that true ? There are colour variations in king cobras depending on seasons. But the science behind it is yet to be studied. Actually I had many more questions about king kobra . It would be great if you can give me your email id . Thank you sir . So sweet of you . 🙂 🙂 . Hi Gowri Shankar Sir, congrats to you and Sharmila. I’ve been searching for your contact number after I lost contact of you in the year 2004. I was part of the team who did an NSS eco camp from Hindustan College of Engineering in year 2002 (hope you remember) at the Vadanemmeli village… I’ve attended your training camps at Madras Crocodile bank trust. I stumbled upon this blog today while searching for adventure activities at Agumbe. 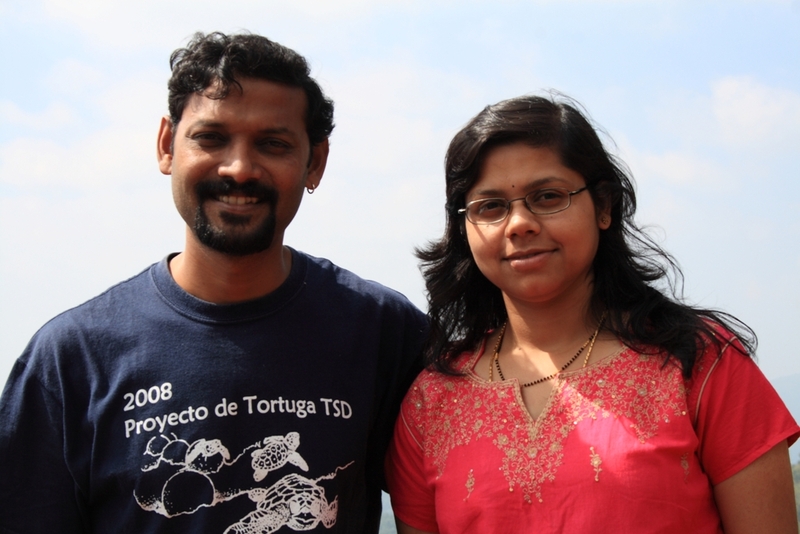 Harish (my college mate who also was with me during 2002) told me that you were at Agumbe. It’s really nice to see you’ve featured on BBC and National Geographic. Is there any workshop organized this year June onwards – I’d like to participate. My contact details are mentioned below. Nice to hear from you. Of course I remember you guys. Do come over to Agumbe anytime. As for camps yes there are couple of them happening. You could join the one from 5th to 7th July at Agumbe. It will be great to catch up. Congratulations Mr.Gowrishankar for all the efforts you make to save the most revered snake especially in coastal and malnad…I had seen almost all episodes of you and Rom that was aired in Discovery long back when i was in school…more interestingly after my postgrad i work in Manipal just 48km from Agumbe and quite often i venture into ther just to feel the Monsoon…on my next visit i wish see your conservation project live!!! Thank you Suhas. You are welcome to come over and be a part of our efforts. Hello sir, I am Yaswanth from Andhra Pradesh,Kadapa. I would like to know about one of the member named Anju Reshma who worked with Romulus Whiteker, Gerry Martin, Saloni, Matt Goode, Dev and more in king cobra research center in Agumbe. Please if you have send me contact information of her as i live in her native place. Sorry for what sir. For not having any contact information or not interested to give. Please give me clarity. I don’t have her contact details, Yaswanth. I can see you are really keen about snakes. The best way to go about it is to start reading about them first (books, online etc.). You could attend workshops and camps, intern or volunteer with organizations/Researchers who work with snakes. All the best. I have a question. Is there any species of venomous snake that the king cobra has difficulty hunting and killing? I realize the king cobra has resistance to certain types of venom, but would the king fare well against a mature diamondback rattlesnake, assuming they shared the same habitat? Apologies for the late response. In regard to your question, size of the prey and predator plays an important role. The bigger and the stronger one get the better of the other. During our radio telemetric study we have observed that kings use different techniques to tackle/capture venomous and non-venomous snakes. In captivity, zoo keepers have tried to feed king cobras with Russell’s Viper (Daboia russelii) (the fangs of these snakes are quite big – almost 2 inch long) and have observed them to be very careful in tackling and feeding on them. This is expected considering two factors, one is the venom and the other is the size of fangs. If they do not exercise caution these snakes (Russell’s Viper) have the ability to cause severe damage to the king during their struggle if not death. Russell’s Viper can be compared to rattle snakes and I believe similar reactions may be expected. I hope this answers your question. I am a student of Indian Institute of Science Education and Research Kolkata studying 2nd year Integrated MS.Though i am from mysore. I am interested in behavioral ecology. And in particular as for my first study in it i want to study the king cobra and its behavior with its own species as well as with the other species of snakes in its own habitat. So i want to do a internship at your research center on the behavior of king cobra to study its behavior. So can you please whether its possible for me to do an internship at your agumbe research center as i am really very interested in it. I was interested in these things from my childhood and also seen your documentary on the national geographic channel and now i am science student i want to scientifically know about the cobra which i had been alluring for such a long time after seeing snake shyam of mysore so gracefully taking the snake while it does nothing to him but to others is a wild creature. I am aware of the workshop thats held in december but i dont want to take part in that because i want to study the king for a long period so that i can really get to know it a lot. I hope you look forward to my request and reply. It was very rewarding to read about the King Cobra. I recently saw a one at close quarters on my trip to the Malnad area. Keep up the good work. Thank you Nisha. Seeing a king from close quarters is one of a kind of experience! I will be reading your other blogs soon. Are you on Face Book? I have posted a few pictures of the king on face book, not very good ones as I met him at 11pm onwards with no lights except for the moon light and of course torch light. All the best to you. Yes Nisha I am on facebook. Thank you. My son is doing a report for school on King Cobras and we cannot seem to find any information on whether the King Cobra lives alone or in groups. Can you answer this? Many thanks. Hello Gowri, i am 22 year old backpacker from Spain. I love snakes as much as you do! I am thinking about visiting Agumbe in the second half of april, could i meet you there?? I will most likely be around. Kindly confirm the dates and will let you know. It will be a pleasure to meet you. I am Harsha from shimoga. Its been my earnest desire to meet you as I am a true follower of your research in the field of snakes particularly, King Cobras. I came across a fact that you would be staying in Agumbe for your research program. Is it possible for me to meet you there? Thank you and I appreciate your interest. I will be in Agumbe during the weekends of this month.You are welcome to come down. Please intimate in advance to this email info@rainforestecology.com before hand(atleast 2 days in advance). Hello! I am currently in Rishikesh and longing to find a way to learn and experience more about the local snakes. Back home I work with and handle various reptiles and educate the public them and the importance of conservation. If you have any tips or contacts for this area you could pass in, I would greatly appreciate it. Good to see your interest. You could contact Manish Rai at manrai62@gmail.com, who is from Thalla Ramgad, Uttarakhand. He may have more contacts. All the best. Can i be able to meet you if i come to agumbe this saturday sunday (29th march)? Iam interacting on ur blog second tine. Sir actually i really need ur help for advise , pls sir i have many expectations wid u. Sir i want to decide my future line,my career , sir if i truely say i dont want to do engineering or anything else bcoz since i have grown up it has always been my dream to be a part of environment conservation or animal conservation.Whenever my parents ask me in which college i want to go i dont have any options bcoz i dont want to do that. It has always been my dream to live for animals, our environment. U r one of d persons who really motivates me. Sir pls can u suggest me some job opportunites in this field, pls sir i hope u cn show me some light, email it to my id or can i talk wid u once. It’s v imp for me sir, i will be v thankful to u………. I can see you are very keen about wildlife. Please share your educational background. It would be good for you to start reading up, volunteering or interning at environmental organizations and learn about things you like first. Your career decision will come later. Thank u sir for ur response, and ok sir I will search for the organizations as u said. And I will definitely try to come at ur camp at least once in future. Hi Gowri shankar, have you moved to Bangalore? We came to Agumbe but couldn’t find your rainforest station / base camp. Can you share any contact details? Hello Naina. We conduct educational workshops and camps at our camp site, Kalinga Centre for Rainforest Ecology in Agumbe. Please write to info@rainforestecology.com for further details. hello sir my name is kshitij shakya. Sir I want to request to you if you ever need a assistent please call me I really want to now more about cobra as much as I can and sir I search a lot about you and to contact you but I got only this blog. Thank you Narayan. Sure do come down to KCRE, Agumbe and we can meet. Hi Gowri, it is a very nice blog. You put impressive amount of work into it. Good luck for your current and future projects! Hello sir! I am impressed about your work on saving,rescuing and creating awareness about snakes.So Im interested to join your team after my studies. How can I join? Please inform me. I am from Mlore. I watch ur documentaries and really amazing and proud to see our kannadiga in national geographic conserving the wildlife . Keep this ongoing journey in the hills of agumbe. All the very best on the coming days. I see the documentaries of urs on national geo and it feels proud to have our kannadiga working with wildlife preservation that too in agumbe. I am from mlore. Wish you a very best in near future and keep up this ongoing along the hills gowri. If you dont mind can u provide me the email address. Love to read the page and yes i would want to be a part of Agumbe carer. Wanted to visit Agumbe on Feb 28-March3 for the observation in Agume Rain forest. Also sent a mail to you on the same and waiting for your welcome cal. Want to visit KCRE on 25-26 march. Send email to kalinga@kalingacre.com . waiting to reply for availability for that time. I read You Blog and big Fan of your Documentries. I want to start a snake farm, So i need a guidance from your side Sir. Sir, Please Guide me how can i start a snake farm. Also sent a mail to you on the same and waiting for your response. Myself Darshan from bangalore, I am interested in attending the STORM workshop. I also did send a mail regarding the same couple of weeks back, guess you are having a buys schedule. Please let me know where and when is the next STORM workshop happening. I would be very keen on attending the same. Hey Sushmita, I suppose we connected through email regarding this. Hello Sanket, We conduct the STORM workshop where we address the topics you have mentioned. Please share your email id or write to kalinga@kalingacre.com for more details about the STORM workshop. The next one is happening in Mysore on the 9th and 10th of Sept.
Hi Gowri Shankar and Sharmila, congratulations on living your dream! Your pics of Agumbe are beautiful, thanks for sharing. I have a question: I recently found 6 eggs about the size of hens’ eggs, in a hollow on the ground near my house. I don’t know if they are the eggs of a snake or a bird – there was no creature nearby, guarding or even watching it. If I send you a picture, will you be able to identify them? I am happy to see someone doing a prolific work to save the flora and fauna of Western Ghats. I have decided to to come and explore and learn. I will try my best to join you sir. All the best for future programmes.